[prMac.com] New Udupi, India - Global Delight, today released a major update to Voila, the screen capturing solution, with more sharing options, enhancements to the annotations and other user requested features. 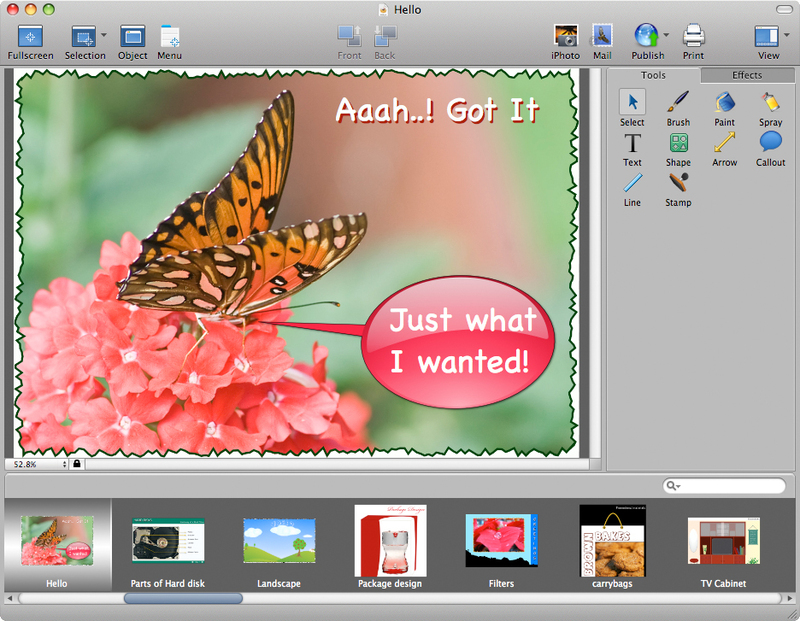 Voila is a powerful screen capturing, annotating and sharing tool on the Mac platform, released earlier in January 2009 at Macworld Expo. Voila now offers additional and easy sharing options. The annotated images can be uploaded to FTP or published to Flickr from within the application. It can also be shared through Microsoft Entourage. Images can also be dragged to other applications. The user interface has been updated with easy zoom options while locking and unlocking the images to the canvas is just a click away. User requested features such as copy pasting the annotations across the images, keyboard support for adjusting the annotations and maintaining aspect ratio while resizing the images and annotations has been included in the update. Six new filters including Saw Tooth and Torn Edge and seven new Stamps have been added in the annotation tools set. "Voila users have been very expressive and have contributed a great deal in improving this tool", said Mr. Rohith Bhat, CEO of Global Delight. "We have tried addressing many of the user requested features and usability issues in this release and are certain that Voila has the best post capture annotating options than any other tool in its category", he added. With the help of Voila, users can organize their reports, presentations, blogs and other simple designs creatively and effectively. Voila runs on Mac OS X 10.5.2 or later, and is designed to run on any Intel as well as PowerPC based Mac running 1.25Ghz and above. iPhoto v6.0.1 or later is required for exporting captured or annotated images. Voila is available for immediate download from the Global Delight site. A single user license of Voila can be purchased for $39.99 (USD). Educational copies can be purchased with a 50% off for a limited period.